A healthcare organization’s ability to explore the deepest nooks and crannies of its data repositories can net it a wealth of valuable information. Search tools and technologies are familiar to anyone who has sat down at a computer and conducted an Internet search. From moms seeking new recipes to office workers gathering statistics, surfing for information has become part of everyday life. What’s new on this front is healthcare organizations’ interest in tapping into this technology to improve operations. Healthcare leaders envision using search capabilities internally to support patient safety efforts, enhance research capabilities, promote the innovative efforts of knowledge workers, and allow administration to reach across information silos to tap into the ideas of clinicians and staff. A white paper titled “Physicians and Web 2.0: 5 Things You Should Know About the Evolving Online Landscape for Physicians” suggests that as many as “245,000 physicians in the U.S. are using Web 2.0 for their practice, indicating they are beyond the stage of the early adopter” in terms of search tool use. Recently, healthcare organizations have begun realizing that information within their enterprises is growing faster than it can currently be managed and searched. Information overload and underload describe in general terms the reasons healthcare organizations have strong interest in search technology implementation. The key reason cited by businesses seeking to use search tools is the ability to increase employee productivity beyond the gains that can be achieved through methodologies such as Six Sigma and Lean Toyota. 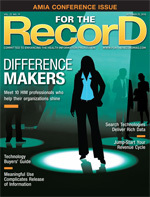 With the increasing number of data and document repositories in hospitals, content can be found in innumerable places. Finding that information often requires a clinician or a staff member to individually search each repository. This approach takes enormous amounts of time and does not ensure the best outcome since employees may not know all the repositories to search. Also, knowledge workers are exposed to numerous versions of the information they seek with no way to establish which is the most current and valid. In the enterprise search model, staff can “spider” over numerous repositories to produce accurate results. Without this feature, knowledge workers may not know where to look or have proper access to all repositories. And the repositories to which they do have access will have to be manually searched. Other issues that encourage entities to develop enterprise search include the constant proliferation of content in uncontrolled environments such as SharePoint, file shares, and e-mail applications. Another issue of particular applicability to healthcare is the complexity of establishing security. Each clinician and healthcare employee must develop profiles that provide contextual search (ie, search permissions to those repositories to which they have a need to know the information but excluding others with the exemption of special clearance). There are several distinct differences between Internet-type searches and the more advanced search technologies capable of spanning entire organizations. Employees, including clinicians, are accustomed to searching in their own particular repositories but are flummoxed when they need information that may reside in other places within the organization. They often do not know where to search, whether they have the correct access privileges to reach into other repositories, and whether they will find the latest version of the information they require. A large healthcare enterprise may have several hundred databases and IT systems, some of which are legacy systems that hold the more historical information needed for research or to prepare for audits. In his 2006 address at Microsoft’s CEO Summit, Bill Gates acknowledged the enormity of the data contained in organizations but also recognized the business value in the development and application of tools that would uncover the knowledge buried in most organizations. The problem with what to do with all this data is twofold. The first is information overload. Faced with the endless deluge of data generated every second of every day, how can we hope to keep up? And in the struggle to keep up, how can we stay focused on the tasks that are most important and deliver the greatest value? The other problem is something that can be dubbed “information underload.” Organizations are flooded with information, but that doesn’t mean they have the tools that allow them to use the data effectively. In his address, Gates underscored Microsoft’s aggressive interest and entry into the world of search tools and technologies, an arena dominated by Google and others offering advanced search capabilities on the Internet. However, the marketplace for search capability internal to enterprises is wide open to all comers that can provide customers the ability to “know” their own knowledge across organizational information silos. Forward-thinking organizations already engage in some forms of searching. Searches against individual data repositories (ie, against a structured database containing coded data) are quite common. On a more advanced level, clinicians often query clinical databases when dealing with an elusive diagnosis or in research efforts such as when they access tumor registries to ascertain what may be the most effective treatment approaches. Organizations with more resources may have developed clinical data repositories (CDRs) containing data feeds from many clinical sources that provide a richer experience for information seekers. However, these repositories are generally limited to structured data responses. When dealing with the Internet, search engines consist of three parts: a database of Web documents, the search engine that operates on those documents, and a program that determines how the search will be displayed or reported. Efforts to develop enterprisewide searches must consider many of the same factors as Internet searches but also go beyond that scope. One key consideration of Internet search technology is the ability to provide relevance. These searches are governed by the entry of key words that will trigger results that consumers will find most relevant. Naturally, this logic is also pertinent to internal searches within a healthcare organization. However, a keyword approach within a healthcare entity would require an organizational effort to develop controlled vocabularies with standardized language terms. For example, healthcare entities must standardize the basic demographic fields that comprise the patient identifier across all repositories in the organization. Disparate repositories of information using key fields other than a patient identifier for searching must develop standardized definitions and fields. For example, accessing a database or an unstructured document and image repository under the domain of finance or human resources such as an enterprise resource planning system would require standardized definitions for terms such as “employee” and standardized fields throughout the system’s databases and repositories for a field named “employee” identifier. Enterprise search also implies a search that is comprehensive. This requires vendors that can provide searching capabilities across hundreds of repositories containing as many as 400 different document types, multiple data types, and images requiring standardized indexing. Vendors must be able to work with entities to design a hierarchy of information comprehensible to the users sending queries across multiple archives. Most Internet users are unaware that there are millions—even billions—of files they cannot access via Google or any other popular search engine. The only files Google and other search products can access are those that the internal staff have indexed or that have a link within them that takes users to documents not available directly by searching the Internet. • Phase 1: The ability to search the CDR, if one has been developed, the enterprise content management repository of administrative documents (eg, policies and procedures governing infection control), file shares (the 220 different file formats, including HTML, PDF, Microsoft Office, Open Office, used on desktops), intranet content, selected databases, and the customer relationship management system for entities with health plans. • Phase 2: The ability to search phase 1 targets plus two of the clinical content repositories, the e-mail archive, other content repositories, the ERP system, and collaboration site content. • Phase 3: The ability to extend search throughout the enterprise (federated search) to Web content, any remaining clinical repositories, data warehouses and structured data repositories, and blogs and wikis. Other technical innovations are constantly under development to add to search efficiency. For example, automatic summarization employs a computer program that can create a shortened version of a text, allowing those who receive multiple results from a query to rapidly scan them for relevance. Collaborative filtering involves using existing data to match a user making a query to similar users in terms of the likelihood of locating what users would find relative to their own particular searches. This implies associating like-minded users with one another to support better search results. In addition to easing clinician and knowledge worker efforts to find pertinent information, search tools protect organizations in a discovery situation by permitting those in legal services and compliance to locate all required information requested by court order or subpoena. Through search methods, high-risk documents can be sequestered behind a wall of keywords accessible to only authorized searchers. The requirement of an efficient federated search for assigned ownership and management of all enterprise information positions the organization’s legal defenders to support their healthcare providers and to prove the organization is operating with best practices in information management. Last but not least, a successful implementation of enterprise search translates to the ability to manage organizational cost through access to comprehensive productivity information in multiple repositories, control of organizational risk through better information access, and the enhancement of knowledge workers’ ability to create innovative solutions through access to multiple repositories of data and previously unavailable records.